Much has been written about the difficulty in attracting and recruiting millennials. Likewise, there are volumes of articles, blogs, books and tweets about perceived difficulties in managing, motivating, retaining – in truth, understanding millennials in the context of a traditional work environment. Millennials experience, like all employees, begins on day one (or sooner) and as they say, first impressions last forever. 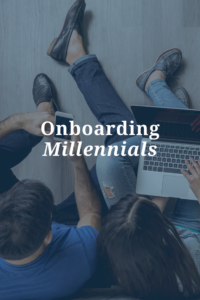 Ensuring success with your millennial hires can be greatly enhanced by considering tailored onboarding processes with them in mind. Begin the onboarding process BEFORE day one. Reach out to your new millennial hires with pertinent information about start time, dress code, address, transportation, parking options, and some information about their orientation process. Include links to internal information as well as external that might allow them to prepare themselves better. Don’t forget that millennials like to know that their value is perceived and that they are appreciated. Also, include messages that make it clear that you are looking forward to their joining THE TEAM. Remember these are millennials and phones, email and snail mail are not their preferred form of communication. Consider imparting this data by text, tweets or video. Make sure your message is individualized and not canned feeling. Finally, it is likely that 8:00 AM on a Monday is not a common reality for your new employee. Perhaps starting later in the week and mid-morning would be a good accommodation! Millennials will be looking for people they can relate to. Utilize your existing Gen Y employees as part of the welcoming process. Millennials are Social Media communicators, so consider a Facebook page or other Social Media platform as a way for your newer employees to connect. It’s also a great way to get your messages across in a familiar and comfortable manner. Millennials, the ‘we generation’ love inclusiveness – they also love things. A mug, or mouse, mouse pad, flash drive with their name on it would be cool. Customized gifts are always a hit. T-Shirts too. Once your employee has arrived and settled, allow them some space to personalize their work environment. If they want a troll doll, poster, or tapestry in their cube, consider allowing it. Now that your millennial is settled in, remember that they are new at this and don’t know what to expect nor what is expected of them. This includes not only their duties, but also how they are to approach the work environment, time off, communication with peers and supervisors. CLEAR communication of expectations will set the employee in the right direction. While verbalizing expectations has been sufficient historically, this information will be better absorbed if it is blogged, a video or other familiar delivery that can be referred back to. Keep day/week one engaging. Your energy and attitude will be perceived and reflect heavily in the millennial’s impressions. Let them know that you are accessible, there as a coach or mentor and that you are invested in their success. Nurture the relationship and trust and loyalty will be your reward. Once your millennial is on board, remember that constructive and ongoing feedback is important. In the Gen Y world, feedback should come in a constructive manner and include suggestions or actions.